I try to keep up with Pittsburgh sports when I’m away because I've always felt a connection with the city's sports teams. When it comes to following the Penguins, Pirates and Steelers, I tend to follow certain writers more than others because I know I'm going to read quality factual reporting. One of said quality writers is Josh Yohe. His writing style is so affable that when you read one of his columns, you feel as though you just sat down next to a good friend for a beer and a little hockey talk. This summer I've been enthralled by Yohe's “Good Dudes” series. 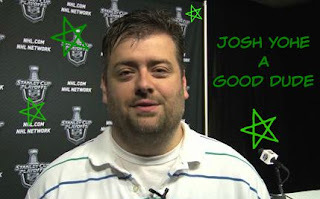 Leave it to Josh to use his unique access to the big names in the Pittsburgh sports world not as a platform for gossip or to sling mud, but to shine a light on those who do the high pressure jobs and still manage to be “Good Dudes”. The only thing wrong with the series is that by virtue of who is authoring it, it will never showcase a certain someone who I think deserves to wear the Good Dude sash and be counted among those who make a difference via the positive attitude they bring to all they do. By all accounts, Josh is a Yinzer through and through. Born and raised in Peters Township, he is the classic local boy who made good. After graduating from Point Park University, Josh spent five years covering all sports at all levels for the Daily News in McKeesport. In 2009, he became the Penguins' beat reporter for the Tribune-Review. Since then, he has evolved into one of the most trusted and beloved voices in Pittsburgh sports. This spring, Josh left the Trib to join Dejan Kovacevic at DK on Pittsburgh Sports and ‘Burgh sports fans seemed to approve: when the Yohe announcement was made official, the site had its largest subscription surge to that point. Kovacevic said of his protégé, “He gains the trust of those he covers the old-fashioned way: He earns it. They know he'll keep his word. They know his questions are sincere, well-conceived and never intended with malice even when they raise a negative topic.” When asked what made Yohe a “Good Dude,” DK replied, “He's maybe the only person I've ever seen in our business who has no boundaries. He'll be as friendly and professional with a direct competitor, as with a co-worker of many years”. Why do I choose Josh as Pittsburgh’s Good dude? There are some in Pittsburgh media who have no time for bloggers or are seemingly threatened by the increasing talent in the blogersphere. He’s kind, quick witted and generous in sharing his vast hockey knowledge. When he asks how you are, he sincerely wants to know how you are. Earlier this year, I wrote a piece for Pens Initiative and got some stinging comments on Twitter (imagine that). Josh messaged me to say he liked what I wrote and that the comments were off base. He shared with me that his greatest strength and his greatest weakness was that he cared deeply about what others thought of him but advised me to “Let it go”. Yohe went on to give me feedback on my writing and to remind me there would always be people more than willing to criticize but to not let them stop me. His message of encouragement ended with, “Trust me”. I do trust him. How many busy media people would go out of their way to offer support to a blogger? He’s breathing rare air. Sam Kasan: Yohe is as solid of a dude as they come. Character man with an incredible sense of humor. His jokes are often the most entertaining part of practices. Mike Colligan: Josh stands out because he puts in the effort to do things the right way. He genuinely cares about the teams and the people that he's covering, but doesn't take shortcuts or cheap shots along the way. Josh doesn't need to be the story -- and there's something to be said for that. He does a great job balancing the insider perspective with the true essence of storytelling in today's media world. Brian Metzer: Josh is one of the few people in this business that I can honestly call a friend. He is a salt of the earth kind of human who will do anything for you. He is an excellent writer who has an ability to deliver his message/story to a wide ranging audience. He is generous with his time and always willing to go above and beyond to help out with a story, a radio appearance or even a ride, as he did often when we were in Florida together. Josh has a knack for making players, coaches and management personnel feel comfortable and that allows him to get the information he needs to do a bang on job each and every day. Ian Altenbaugh: Whenever the Penguins give me a credential I always make a point to set aside some time to say hi to Yohe and get a few minutes of his time to talk NHL and hockey in general. There are a few guys, but him and Brian Metzer helped me out a lot early on and have continued to help me out to this day. The first time I was credentialed for a training camp, it was for the 2011-12 season. The CONSOL is like a maze to the uninitiated. There are a dozen ways to get to a location, but it does not make it any easier to navigate the area. Yohe was a guy who showed me the shortest routes to the locker room, but he also took the time to introduce me to a handful of people there. Paul Clemente: I hung out with Josh in Erie during the NHL lockout. I sat with his family and he was so happy to introduce them to me. I thought I'd give Josh a break with taking Hockey but that lasted about 3 mins before we talked for hours about the sport we love. He's a great conversationalist and we shared ideas instead of trying to impress each other. I think that openness translates into his professional life. You can read something by Yohe and feel informed instead of an insider hoarding secrets and arrogance. Mike Asti: Josh has been one of my mentors in my career. Some of you know I made the short list for the Blue Jackets radio host position, but upon Grover's exit, Josh recommended me to the Penguins. Josh has always been one of the few high ranking media members who have been supportive of youth in the industry, especially in the Pittsburgh market. And he doesn't have to be that way either. Josh Yohe embodies a "good guy" for sure. 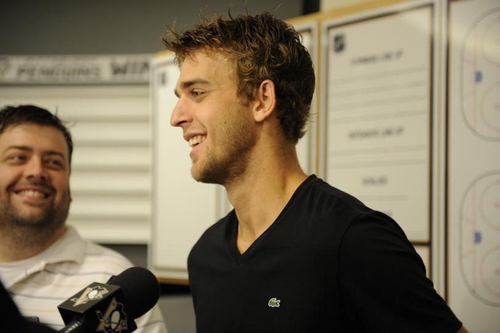 Nicholas Case: I first met Josh through a mutual friend, Aaron Rieber, in 2010 during the Winter Classic. He was nice enough to break away from his work and lead me around CONSOL Energy Center while very, very lost and looking for the Penguins locker room. Since then he's been someone I take great pleasure to sharing the odd DM and text with, who made me feel welcomed when I interned with the Penguins in 2011, inviting me out and offering to help me at every turn. A consummate professional, it's been a pleasure to see Josh rise through the ranks. It couldn't happen to a nicer person. A person I'm privileged to call my friend. It's clear to see that Josh is the quintessential "Good Dude". That he has been a member of the media for so many years and garners such praise from his colleagues speaks volumes. Josh Yohe is the perfect guy to showcase the good dudes of Pittsburgh. After all, it takes one to know one.